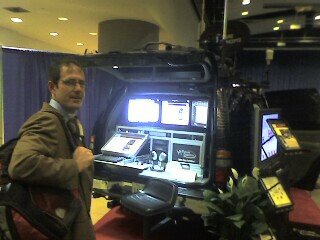 Überblogger "MountainRunner" checks out Future Concept Inc.'s "ANTARES": Advanced National Tactical Awareness Response Emergency System. This system is a fully interoperable communications system, with SATCOM, UHF, VHF, and a variety of customizable comms capabilities, optimized for community first responders (fire, sheriff,etc.). After stopping by the Government of Sweden's sponsored information sessions, we were joined by David Axe of WIRED's Danger Room 'blog. Along with Dr. Amy Zalman and Bob Buderi, this brings our Blogger total to seven.